The Rebel Sweetheart. 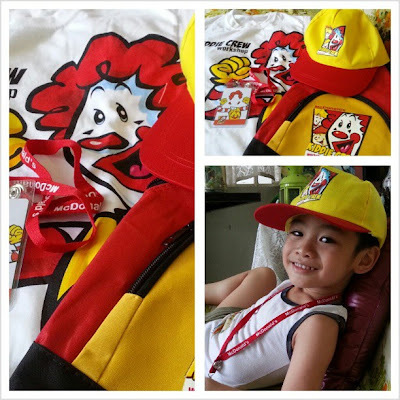 : Wordless Wednesday #33 | McDonald's Kiddie Crew! The little man will go on board next week as a Kiddie Crew at McDonald's. That sounds like fun! I don't think they have that here. They have McDonalds, but not a program for kids. What does kiddie crew mean? I've never heard of kiddie crew? What do they do? He looks pretty happy. We are still a few months away from break, but we like to be outside a lot gardening, swimming, picnics etc. Happy Break to you all! Sounds like a fun opportunity! Yah, I don't think we have a kiddie crew here. What is it? Never herd of the Kiddie Crew....I linked up my WW but I don't see it?? The Kiddie Crew is a 5-day workshop usually offered during the summer here in the Philippines. He looks so happy to be a part of it all. Have fun! He looks like he had fun as part of the Kiddie crew. I haven't heard of this program either.